This roughly cut tubular pasta with ridges is Rigatoni from pasta maker Gentile. One of the top delicious classics, this Italian pasta can be great with all kinds of meat, tomato, and cream sauces. Much like other tubular pasta such as penne, its ridges and hollow middle are great for holding all types of sauces. You can try serving it with ragù, Pomodoro, marinara, Arrabiata, pesto, or Carbonara, and you’ll see what we mean. 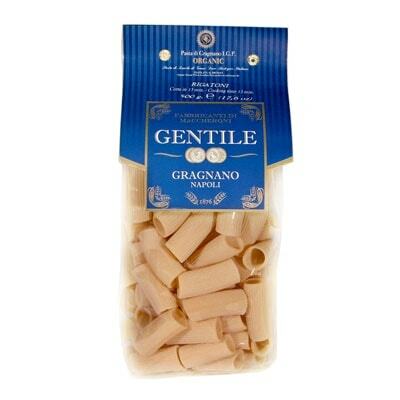 But unlike penne, each of these Gentile pasta is a bit bigger. Curious about this classic pasta? Try using them with your favorite sauce today!